Japan_Series_Most_Valuable_Player_Award - TerritorioScuola Enhanced Wiki Alfa - Enhanced Search with WikiPedia Using Robots to display related resources from the web to all WikiPedia words (Video/Audio, .doc, ,pdf, .ppt, maps, edu, .html). Hideki Matsui won the 2000 Japan Series MVP with the Yomiuri Giants. He went on to win the 2009 World Series MVP with MLB's New York Yankees. The Japan Series Most Valuable Player (MVP) Award (日本シリーズ最高殊勲選手, Nippon Shirīzu Saikō Shukun Senshu) is given to the player deemed to have the most impact on his team's performance in the Japan Series, which is the final round of the Nippon Professional Baseball (NPB) postseason. The award was first presented in 1950. The series follows a best-of-seven playoff format and occurs after the two-stage Climax Series. It is played by the winners of the Central League Stage 2 series and the Pacific League Stage 2 series. The most recent champions are the Fukuoka SoftBank Hawks, who won the 2018 series, and their catcher Takuya Kai the current holder of the award. Kaoru Betto won the inaugural award in 1950 with the Mainichi Orions. Depending upon definitions, the first non-Japanese to win the award was either Andy Miyamoto in 1961 or Joe Stanka in 1964. Fifteen Japan Series MVPs were inducted into the Japanese Baseball Hall of Fame; Osamu Higashio (1982) is the only Hall of Famer to have won the Japan Series MVP between 1981 and 2000. Higashio is also the first and only pitcher to appear solely as a reliever to win the Japan Series MVP. Eight of the ten Japan Series MVPs who have won the award since 2000 are still active in professional baseball—Atsuya Furuta and Takashi Ishii are the Japan Series MVPs from that period who are inactive. Hideki Matsui and Norihiro Nakamura are they only two Japan Series MVPs to play in Major League Baseball (MLB). 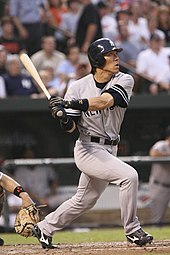 While Nakamura's MLB career lasted less than one season, Matsui's lasted seven seasons. He became the only player to be named both a Japan Series and a World Series MVP after winning the latter award in 2009. The reigning Japan Series MVP is Brandon Laird of the Hokkaido Nippon-Ham Fighters. Sixteen of the 60[needs update] Japan Series MVPs have also won the NPB MVP or the Eiji Sawamura Award in the same season. Shigeru Sugishita (1954), Tsuneo Horiuchi (1972) and Takehiro Ishii (1992) are the only players to have won all three awards in the same season. Two players won the Eiji Sawamura Award and the Japan Series MVP in the same season: Takehiko Bessho (1955) and Takashi Nishimoto (1981). Ten players have won the Japan Series MVP in the same season in which they won the NPB MVP: Betto (1950), Bessho (1952), Kazuhisa Inao (1958), Tadashi Sugiura (1959), Shigeo Nagashima (1963), Stanka (1964), Hisashi Yamada (1977), Randy Bass (1985), Tom O'Malley (1995), Furuta (1997) and Matsui (2000). Five players have won the award multiple times. Nagashima has won the most Japan Series MVP awards with four wins (1963, 1965, 1969–1970). The remaining four players all won the award twice: Bessho (1952, 1955), Horiuchi (1972–1973), Kimiyasu Kudoh (1986–1987), Koji Akiyama (1991–1999) and Furuta (1997, 2001); Akiyama is the only player to have won the award with different teams. There has been one occasion on which multiple winners were awarded in the same Japan Series: Masayuki Dobashi and Masayuki Tanemo in 1962. Pitchers have been named Series MVP 21 times, 13 of which appeared in both starting and relief roles in the Series. ^ Coskrey, Jason (November 11, 2008). "Lions bare teeth to claim Japan Series". The Japan Times. Retrieved May 8, 2010. ^ Miyamoto was a Japanese-America born in Hawaii. Stanka, a native of the Oklahoma, is indisputably non-Japanese. ^ "List of Hall of Famers". The Baseball Hall of Fame and Museum. Retrieved May 8, 2010. ^ セ・リーグ 最優秀選手. Sports Hochi (in Japanese). Archived from the original on August 12, 2010. Retrieved May 10, 2010. ^ パ・リーグ 最優秀選手. Sports Hochi (in Japanese). Archived from the original on August 12, 2010. Retrieved May 10, 2010. ^ 1950年度日本シリーズ　試合結果 (in Japanese). Nippon Professional Baseball. Retrieved May 6, 2010. ^ 1951年度日本シリーズ　試合結果 (in Japanese). Nippon Professional Baseball. Retrieved May 6, 2010. ^ 1952年度日本シリーズ　試合結果 (in Japanese). Nippon Professional Baseball. Retrieved May 6, 2010. ^ 1953年度日本シリーズ　試合結果 (in Japanese). Nippon Professional Baseball. Retrieved May 6, 2010. ^ 1954年度日本シリーズ　試合結果 (in Japanese). Nippon Professional Baseball. Retrieved May 7, 2010. ^ 1955年度日本シリーズ　試合結果 (in Japanese). Nippon Professional Baseball. Retrieved May 7, 2010. ^ 1956年度日本シリーズ　試合結果 (in Japanese). Nippon Professional Baseball. Retrieved May 7, 2010. ^ 1957年度日本シリーズ　試合結果 (in Japanese). Nippon Professional Baseball. Retrieved May 7, 2010. ^ 1958年度日本シリーズ　試合結果 (in Japanese). Nippon Professional Baseball. Retrieved May 7, 2010. ^ 1959年度日本シリーズ　試合結果 (in Japanese). Nippon Professional Baseball. Retrieved May 7, 2010. ^ 1960年度日本シリーズ　試合結果 (in Japanese). Nippon Professional Baseball. Retrieved May 7, 2010. ^ 1961年度日本シリーズ　試合結果 (in Japanese). Nippon Professional Baseball. Retrieved May 7, 2010. ^ a b 1962年度日本シリーズ　試合結果 (in Japanese). Nippon Professional Baseball. Retrieved May 7, 2010. ^ 1963年度日本シリーズ　試合結果 (in Japanese). Nippon Professional Baseball. Retrieved May 7, 2010. ^ 1964年度日本シリーズ　試合結果 (in Japanese). Nippon Professional Baseball. Retrieved May 7, 2010. ^ 1965年度日本シリーズ　試合結果 (in Japanese). Nippon Professional Baseball. Retrieved May 7, 2010. ^ 1966年度日本シリーズ　試合結果 (in Japanese). Nippon Professional Baseball. Retrieved May 7, 2010. ^ 1967年度日本シリーズ　試合結果 (in Japanese). Nippon Professional Baseball. Retrieved May 7, 2010. ^ 1968年度日本シリーズ　試合結果 (in Japanese). Nippon Professional Baseball. Retrieved May 7, 2010. ^ 1969年度日本シリーズ　試合結果 (in Japanese). Nippon Professional Baseball. Retrieved May 7, 2010. ^ 1970年度日本シリーズ　試合結果 (in Japanese). Nippon Professional Baseball. Retrieved May 7, 2010. ^ 1971年度日本シリーズ　試合結果 (in Japanese). Nippon Professional Baseball. Retrieved May 7, 2010. ^ 1972年度日本シリーズ　試合結果 (in Japanese). Nippon Professional Baseball. Retrieved May 7, 2010. ^ 1973年度日本シリーズ　試合結果 (in Japanese). Nippon Professional Baseball. Retrieved May 7, 2010. ^ 1974年度日本シリーズ　試合結果 (in Japanese). Nippon Professional Baseball. Retrieved May 7, 2010. ^ 1975年度日本シリーズ　試合結果 (in Japanese). Nippon Professional Baseball. Retrieved May 7, 2010. ^ 1976年度日本シリーズ　試合結果 (in Japanese). Nippon Professional Baseball. Retrieved May 7, 2010. ^ 1977年度日本シリーズ　試合結果 (in Japanese). Nippon Professional Baseball. Retrieved May 7, 2010. ^ 1978年度日本シリーズ　試合結果 (in Japanese). Nippon Professional Baseball. Retrieved May 7, 2010. ^ 1979年度日本シリーズ　試合結果 (in Japanese). Nippon Professional Baseball. Retrieved May 7, 2010. ^ 1980年度日本シリーズ　試合結果 (in Japanese). Nippon Professional Baseball. Retrieved May 7, 2010. ^ 1981年度日本シリーズ　試合結果 (in Japanese). Nippon Professional Baseball. Retrieved May 7, 2010. ^ 1982年度日本シリーズ　試合結果 (in Japanese). Nippon Professional Baseball. Retrieved May 7, 2010. ^ 1983年度日本シリーズ　試合結果 (in Japanese). Nippon Professional Baseball. Retrieved May 8, 2010. ^ 1984年度日本シリーズ　試合結果 (in Japanese). Nippon Professional Baseball. Retrieved May 8, 2010. ^ 1985年度日本シリーズ　試合結果 (in Japanese). Nippon Professional Baseball. Retrieved May 8, 2010. ^ 1986年度日本シリーズ　試合結果 (in Japanese). Nippon Professional Baseball. Retrieved May 8, 2010. ^ 1987年度日本シリーズ　試合結果 (in Japanese). Nippon Professional Baseball. Retrieved May 8, 2010. ^ 1988年度日本シリーズ　試合結果 (in Japanese). Nippon Professional Baseball. Retrieved May 8, 2010. ^ 1989年度日本シリーズ　試合結果 (in Japanese). Nippon Professional Baseball. Retrieved May 8, 2010. ^ 1990年度日本シリーズ　試合結果 (in Japanese). Nippon Professional Baseball. Retrieved May 8, 2010. ^ 1991年度日本シリーズ　試合結果 (in Japanese). Nippon Professional Baseball. Retrieved May 8, 2010. ^ 1992年度日本シリーズ　試合結果 (in Japanese). Nippon Professional Baseball. Retrieved May 8, 2010. ^ 1993年度日本シリーズ　試合結果 (in Japanese). Nippon Professional Baseball. Retrieved May 8, 2010. ^ 1994年度日本シリーズ　試合結果 (in Japanese). Nippon Professional Baseball. Retrieved May 8, 2010. ^ 1995年度日本シリーズ　試合結果 (in Japanese). Nippon Professional Baseball. Retrieved May 8, 2010. ^ 1996年度日本シリーズ　試合結果 (in Japanese). Nippon Professional Baseball. Retrieved May 8, 2010. ^ 1997年度日本シリーズ　試合結果 (in Japanese). Nippon Professional Baseball. Retrieved May 8, 2010. ^ 1998年度日本シリーズ　試合結果 (in Japanese). Nippon Professional Baseball. Retrieved May 8, 2010. ^ 1999年度日本シリーズ　試合結果 (in Japanese). Nippon Professional Baseball. Retrieved May 8, 2010. ^ 2000年度日本シリーズ　試合結果 (in Japanese). Nippon Professional Baseball. Retrieved May 8, 2010. ^ 2001年度日本シリーズ　試合結果 (in Japanese). Nippon Professional Baseball. Retrieved May 8, 2010. ^ 2002年度日本シリーズ　試合結果 (in Japanese). Nippon Professional Baseball. Retrieved May 8, 2010. ^ 2003年度日本シリーズ　試合結果 (in Japanese). Nippon Professional Baseball. Retrieved May 8, 2010. ^ 2004年度日本シリーズ　試合結果 (in Japanese). Nippon Professional Baseball. Retrieved May 8, 2010. ^ 2005年度日本シリーズ　試合結果 (in Japanese). Nippon Professional Baseball. Retrieved May 8, 2010. ^ 2006年度日本シリーズ　試合結果 (in Japanese). Nippon Professional Baseball. Retrieved May 8, 2010. ^ 2007年度日本シリーズ　試合結果 (in Japanese). Nippon Professional Baseball. Retrieved May 8, 2010. ^ 2008年度日本シリーズ　試合結果 (in Japanese). Nippon Professional Baseball. Retrieved May 8, 2010. ^ 2009年度日本シリーズ　試合結果 (in Japanese). Nippon Professional Baseball. Retrieved May 8, 2010. ^ "Lee Dae-ho wins MVP in Japan Series". koreatimesus.com. Retrieved October 31, 2015. ^ "Former Yankee Laird leads Nippon Ham to Japan Series title". Associated Press. October 29, 2016. Retrieved October 29, 2016. ^ Allen, Jim (November 4, 2017). "Baseball: Hawks stave off BayStars to clinch Japan Series in 6 games". Kyodo News. Retrieved November 4, 2017.